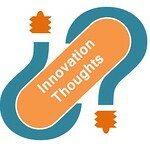 This post tries to answer how Red Bull is approaching Innovation Management. We will take the “10 Types of Innovation” framework of Doblin by Deloitte (framework we have previously posted about) as a reference to describe what are the main keypoints of Red Bull’s innovation efforts. RB started off as a Premium pricing model. An expensive but effective product: “red bull gives your wings”. Innovation brought them to content strategy using guerrilla marketing through their sponsorships. 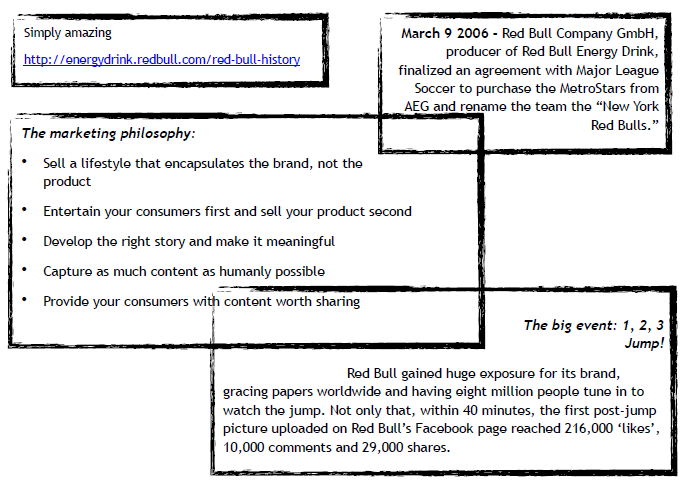 They progressively added new layers to the product: “red bull gives wings to people and ideas”. Now their business model is shifting to monetising their content and reaping more financial benefits from it than from their energy drinks. As of november 2013 Red Bull’s Brand Value was $7.2 B. Due to their content oriented strategy, RB’s network of evangelists is as broad as it can get: music stars, extreme sport stars, formula 1 pilots, aerospace, etc. An army of ambassadors, community managers, public relations, … both, freelance or member of other organizations. They “play hard and work hard” on creating, defining and sharing new content all over the world. • Graduate Programme to attract students, train and motivate them. • Wingman Programme for students working for RB, pairs them with another student as a mentorship. • Performance Cycle for students working for RB, to establish and evaluate KPIs and objectives. RB’s organisation is fully oriented to spreading and maintaining the consistency of the intangible: their brand image. It focuses on non-traditional marketing, originality, and an unbeatable loyalty to the niche market customers who are also their main supporters. What is ironic about RB’s original product is that it does not taste good, it contains an excessive amount of caffeine, has been banned in several countries as a health hazard and has a general bad reputation. However, it works, without exception and reflects a strong consistency of their message to the market. Based on that, there was a certain appeal to the product. But RB wouldn’t have survived the competition if it hadn’t replaced the product: an energetic beverage, for the lifestyle, the idea, the experience. RB provides retailers with a Free RedBull Cooler and in cases a TV that displays extreme sports videos non-stop. Can Lifecycle: this is a RB project to account for their energy consumption by recycling cans. Giving back to the world. RB is a giant in youtube, constantly creating new content. RB counts 40 million fans in FB. There is a premise in all communications relating to RB (marketing, videos, events, etc…): the actual product, the energy drink, must never be mentioned. They use students to distribute their product. The Red Bug Wings Team recruits students, it’s premise is to go and give people a memorable experience to drive brand loyalty. More often than not, RB relies on “bringing the people to the product” by hosting and promoting events. An amazing thing about the RB strategy is that it has successfully expunged the product itself from the brand, the offer, the service and the enhancement. Red Bull has created and sponsored multiple projects in all sorts of areas, from extreme sports to restaurants, research, etc.. provided it motivates people and promotes dynamism. Simply Clever! Hope all this remarks will be useful for our readers. Anything to add? (Personally, it would be great if anyone could shed light on financials related to their content / event strategy. Some blind spots could be definitely understood then 🙂 ). Authors: Ada, Jordi, Marco, Emilio.